Often publishers and agents ask for a synopsis of your novel manuscript. The synopsis functions to provide the barebones information about your plot, character and the stakes of your story. It is usually no longer than one page, which is what makes writing it difficult. The synopsis includes what happens, so it's like a mini-arc of your story. We start here, this happens, we go here and then that happens and we end up there. Creating a SynopSnip is much more fun, more visually stimulating and is for a different audience--the reader. Consider the SynopSnip to be a very succinct snapshop of your synopsis. It is also in a format that makes it easy to distribute on social media, such as Facebook, Twitter etc. Take a look at the one below to see what I mean. Plot: Rachel is the victim of an ancient curse. The Fergus She has been with her since birth, but Rachel thought she was an imaginary playmate (and named her Scarlet), not a demon awaiting resurrection. 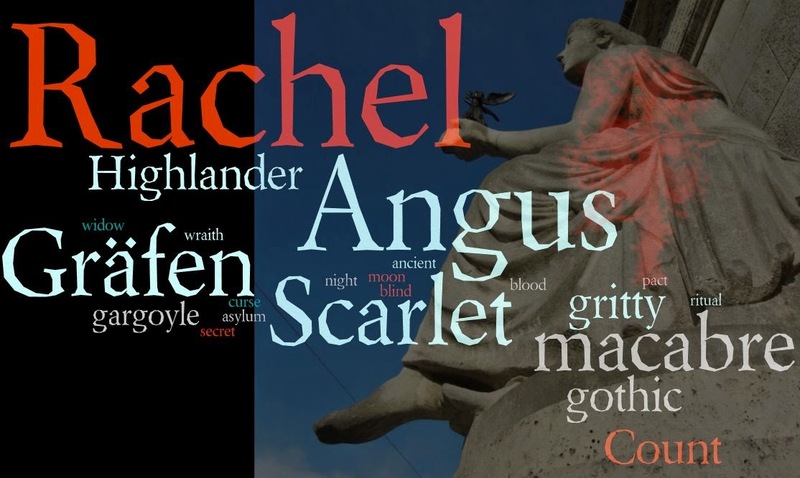 When Rachel's lover Angus turns out to be the catalyst that gives Scarlet complete control, all hell breaks lose, and Rachel finds herself the unwilling plaything of Gräfen, an evil Count. Think about what words would be best for your novel. You can use the same advice for this that is given for Synopsis writing. What's at stake in one word? Go to Wordle.net and select "Create". You'll see a text box open up. This is where you type in those important keywords for your novel. To make a word bigger, type it more times. Here is the formula I used for my SynopSnip. Click "Go". Now you get to change the colours, the font, and the layout. Play with the choices until you have a SynopSnip that is actually a brand for your novel. For example: If your novel is a romance, then you'll want to pick blues and reds and yellows. You'll also want to choose a font that has curves, is fairly modern looking (if contemporary) and smooth. Layout should be mostly horizontal. Copy the finished Wordle into your clipboard by clicking Ctrl+Prt Sc or save as an image. Re-open or paste the Wordle into a graphics editing program that allows layers (photoshop, artrage studio). Find another image that works well to represent your novel and paste that into a layer above your Wordle. Then reduce the opacity of that image to allow the Wordle to show through. Add a few effects (I added the red on the stone statue to represent the inner demon) and save as a JPG of GIF, using the novel title as part of the file name. And that's it! Now you have a SynopSnip to send around the Internet promoting your novel. Make sure you embed a link to track and enjoy the feedback you get.